Happy Thanksgiving! This year we’re not just munching on delicious Thanksgiving Day foods, we’re also really focusing on what today is actually all about: Giving thanks! 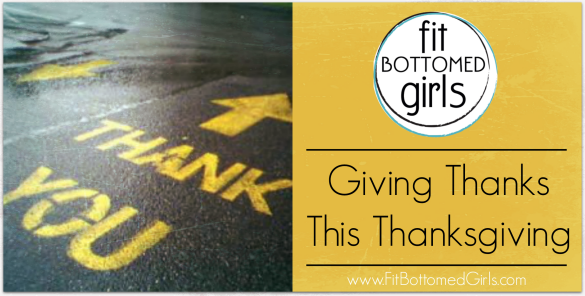 Below are three things that each of the Fit Bottomed Girls are thankful for, in addition to the one big thing that we are grateful for each and every day—having great readers like YOU! Doing what I love! In this challenging economy, I feel so blessed that I am truly doing what I love and going after my passion. There is no greater gift in life. My support system! From my husband to my parents to my closest friends (FBGs Erin and Tish, what, what!) to even my dog who cracks me up every day, I am so darn blessed to have such amazing people in my life. Weight-loss challenge contestants! It has been nothing short of awesome to get to know these ladies and watch them grow and change over the last few weeks. Talk about inspiring. My fam-bam and friends! I’m so very thankful for my family, guy and friends for keeping me on my toes and filling my days with oodles of entertainment. They make the world go round. The Fit Bottomed Girls! The FBGs have pushed me this year. In the past, my laziness, doubt and boredom would have been the end of my gym days, but the FBGs have introduced me to a whole other realm of fitness fun. Passion! Being able to daydream, imagine, question and create has kept me (and I presume my living-mate) laughing into the wee hours of the night. I’ve learned that holding on to one’s childlike curiosities is good for the soul. It keeps the bitters away. That I know for sure! I’m thankful for my amazing husband, this incredible little life growing inside me, and for my sister-in-law’s delicious roasted root veggies. Yum!